I was happy to have some time on Mother’s Day to go for a quick-ish hike / trail run. 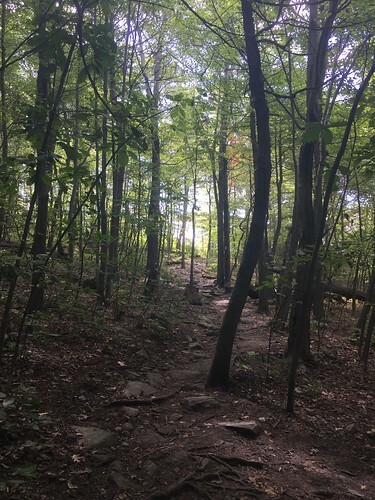 I had remembered that I wanted to check out the portion of the Appalachian Trail that is pretty close to my house so I abandoned my kids and took off for the trail. 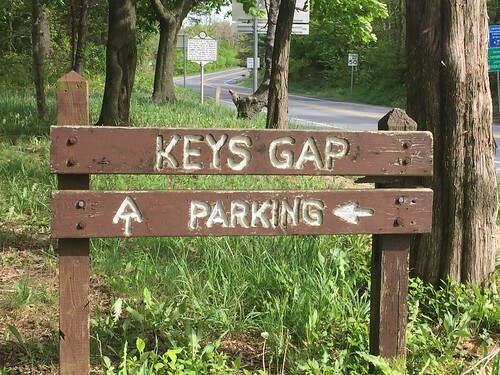 Keys Gap is about a 25 minute drive from my house – depending on how many slow people are driving on Rt 9. I was worried the trail might be busy with people out hiking with their moms but the parking lot was almost empty. I took off running on the trail but quickly encountered pretty deep mud. I am not scared of running or hiking through mud but I still took my time to go around the deepest parts. 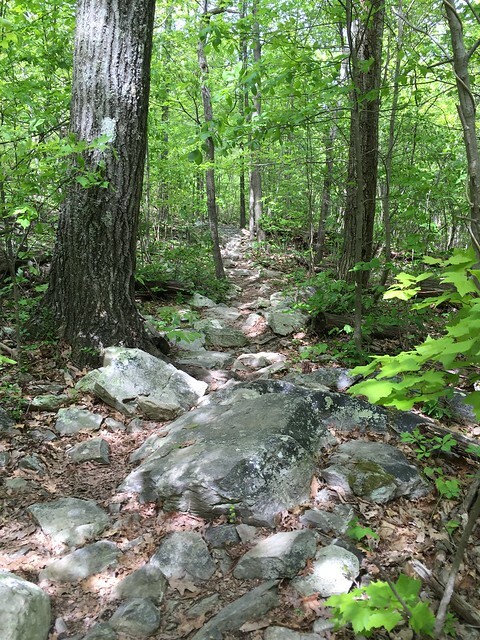 When I could, I would run but soon I was slowed by the number of rocks on the trail. 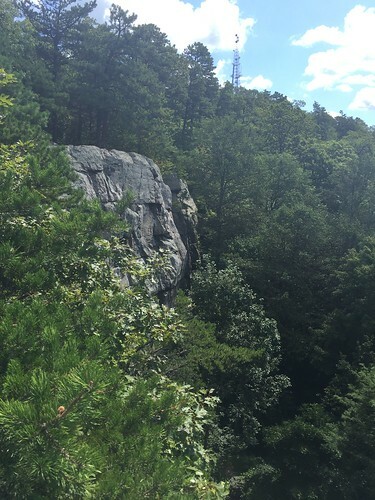 I wasn’t interested in falling or twisting an ankle so I took my time and just hiked. 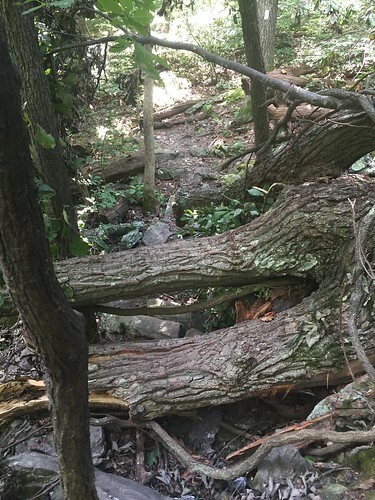 This trail leads to Harper’s Ferry. Since I got a late start there was no way I was going to make it all the way there. 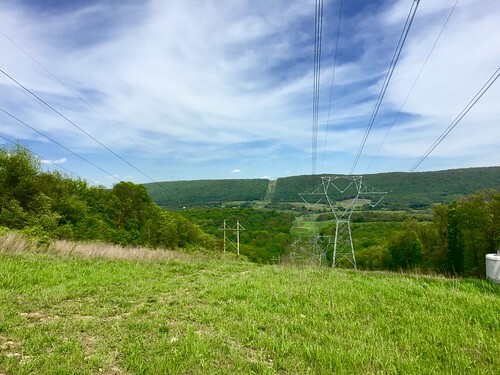 I also thought that there might be more views on this trail but in the distance I went (2.5 or so miles one way) there was only one look-out area thanks to some big power lines. 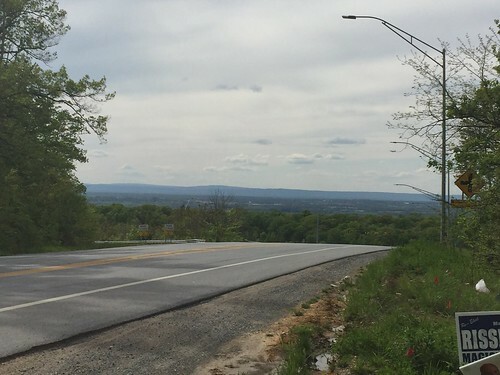 On my way back I passed a family who was out for a hike and the mom asked me if there were views. I was sad to tell her there was just that one. It’s a decent one but made ugly by the power lines. The week’s worth of rain we received really made everything very green. I’m very much a scenery hiker. I like to look at things and see views and pretty nature. This trail isn’t the greatest for that. I did pass a large rock wall (no indication if it was original, new, or private property). 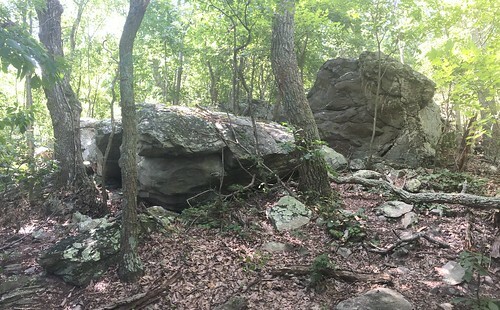 And the rocks along the trail were kind of cool but I missed seeing “things”. If I had gone south I think I would have had more views so I will definitely consider that next time. I’m also anxious to hike out to Harper’s Ferry and back at some point. I had the trail to myself for 90% of the time. On my way back I passed that family hiking and I encountered a woman hiking with 6 dogs. They were all very cute and friendly but I can’t imagine that task of getting them clean once arriving home. I played music without headphones for the first half of the hike. I turned it off for the second half so I could just enjoy the solitude. Also – why do squirrels sound like the largest animals in the forest. Can’t they run with a little more delicacy? I can’t wait to go back and experience more of the Appalachian Trail when I have more time. 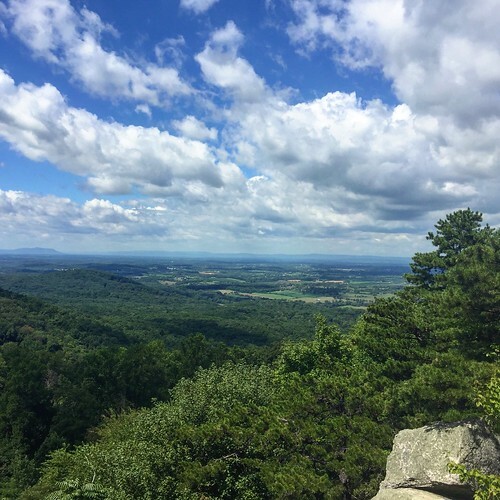 I definitely will be taking it south to Buzzard Rocks and then going all the way to Harper’s Ferry. Check out all my photos from the hike.